The remains of a Roman Hypocaust were found on the west side of the village, not surprising given our proximity to the A140, the Roman road to Norwich. 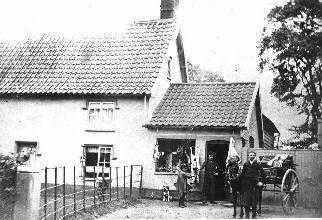 Many of the houses in the village are 14th and 15th Century, and these can be clearly seen as you go along the ‘Street’ (A1120). 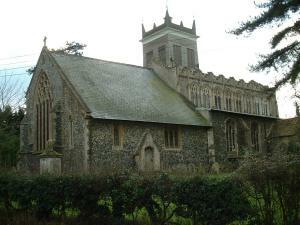 The Church has a wooden steeple and ten fine bells. 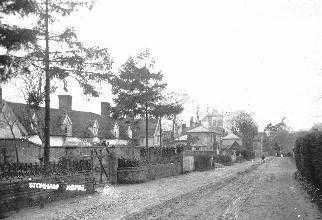 A view up the street with the Spire of the Church in the distance. 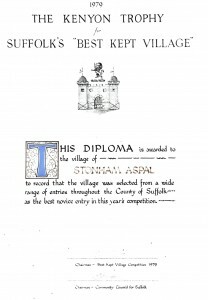 The is available from the Heritage Site at Suffolk County Council. I have been asked several times to put some pictures of the Red House on these pages. Here they are, by kind permission of the present owners. 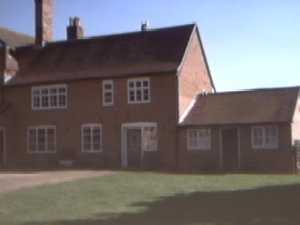 The Red House is the former home of George Packard, whose son Samuel Packard was baptised on 17 September 1612 in the Church. Samuel sailed in The Diligent from Ipswich in June, arriving in Boston Harbor, Massachusetts on 10 August 1638. 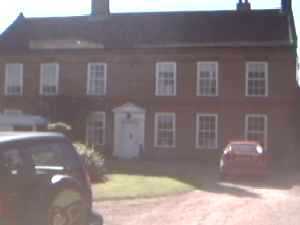 This is the 18th Century front of the House. This is the 14th Century back of Red House. Samuel Packard was born in the room on the top left. I have been told that Packard descendents went on to start Companies such as Packard Cars and Hewlett-Packard. 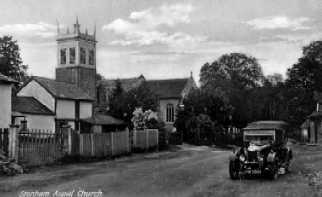 The beautiful clerestoried church, at the end of its long street, is 600 years old, and separated from it by a shady lane, part of its moat still filled with water, stands Broughton Hall, now a farmhouse but long the home of the Wingfields. The house has preserved the great chimneys under which the yule logs blazed for many generations. On a white marble monument in the churchyard is a figure of Anthony Wingfield in his 18th century wig and cravat. The old tower is rare in having an upper storey of wood, substituted for masonry in the 18th century to lessen the danger from the vibration of its ten bells. There is an impressive doorway in the wide north porch. Many fine windows light the interior, where colour glows in the 14th century heraldry, roses, and fruit of the clerestory glass, and in the ancient shields, coats-of-arms, and the remains of a Jesse window in the aisles. In the east window, with a Cucifixion, a Last Supper, Gethsemane, and other scenes, are 66 figures. The oldest monument is in a chancel recess, where, in fine chain mail with his hands in prayer, lies a man of the 14th century who may have been the founder of the church, one of the Aspalls, whose rich heraldry is in a window. The bowl of the font is the one at which he would be christened. A portrait shows John Metcalf, in his priest’s robes and ruff, rector for 32 years of the 17th century, and a record of faithful service in our own day is that of Robert Thurlow, who rang the bells for 60 years. The church treasures many old documents, one a deed of 1397, and a mighty receptacle guards them, a magnificent 15th century iron chest eight feet long, armoured with bands and studs, its massive lid so heavy that pulleys are necessary to raise it; it is a wonderful piece of work, as sound as new. There is medieval screen with traceried panels, a fine Jacobean altar table, and a Jacobean pulpit, whose sounding-board has been made into a handsome table. The poppy-headed bench ends are triumphs of carving. Two in the chancel have splendid arm-rest figures of an angel, an eagle, a winged lion, and a winged bull; 16 in the nave (some carved by villagers still living) have a griffin, an eagle, lions, praying figures, and a wolf guarding the head of St Edmund. Over the tower doorway is a modern figure of Christ in wood. The vestry, with a low window overlooking the sleeping knight in the chancel, is panelled with parts of the old roodscreen, and has a cupboard made from a Tudor reading desk. Above the door hangs one of the odd little collections we sometimes find in churches, a truncheon, the parish constable’s handcuffs, and a sickle made for a left-handed man. 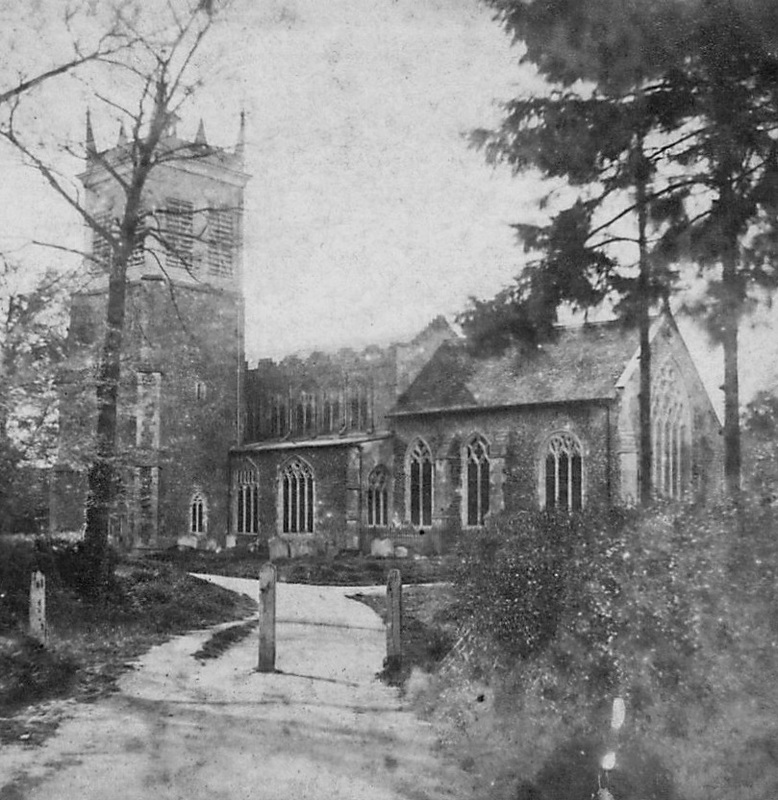 circa 1865 Photograph taken from a stereo pair. 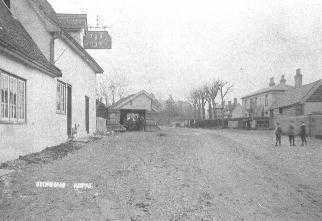 The entrance is different, it probably shows the Town House (a Community or Village Hall), which until 1873 was on the left, and was removed on wooden rollers to East End Lane in that year. 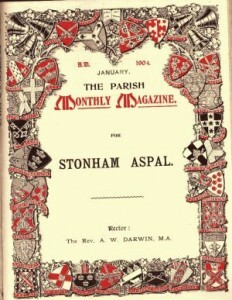 In 1909 the monthly magazine was enlarged to incorporate The Creetings, Earl Stonham, Stonham Parva and Mickfield. The Magazine covers all aspects of village life – church and social, baptisms, marriages and deaths, education, entertainment and of course fund raising! There are articles and stories and the “Home Help” page from about 1924 makes one realise how expert they were at “make do and mend”! Best novice entry in 1979!